Roman Republic. Anonymous struck Litra. ca. 230 to 235 BC. 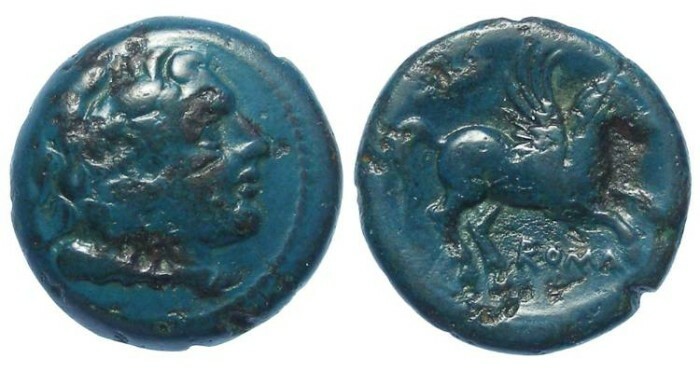 Mint : While these coins were minted for Rome, it is unlikely they were struck at Rome, but rather on their behalf somewhere in Southern Italy. Reference : Sear-591. Cr. 27/3. Syd. 7. Size : 18.6 x 19.2 mm. Weight : 6.22 grams. Grade : aVF/VF with a glossy green patina, but some pitting. Obverse : Head of Hercules right, with a club on his shoulder. Reverse : Pegasus flying right, with ROMA below and a club above.